SANGAM15 : It’s nearly here! 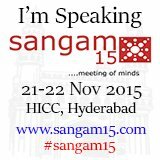 In about a week I will be starting my journey to Hyderabad to speak at SANGAM15, the big AIOUG event for India. 7 hour flight to Dubai. 3.5 hour flight to Hyderabad. 2 days in the conference. I’m from India and read your blog regularly. I’m based out of Chennai (about 400 miles from Hyderabad) and will not be able to make it to the event. Good luck with your India trip. Mukundhan: Thanks for the message. It’s a pity you can’t be there! I was in Chennai last year.